Guest post by Irini Topalidou. In the last decade or so, biological research has moved to a new level of complexity and competitiveness. Principal Investigators (PIs) are now primarily tasked with grant writing and managing, while also executing the numerous additional responsibilities the position demands. But to be successful, labs require experienced scientists to help run them. There is a growing need for highly skilled, well-trained scientists who can run complex projects while also training and supervising students, evaluating data, writing manuscripts, contributing to grant writing, and managing the lab’s day-to-day operations. Postdocs are rarely in a position to perform these tasks, given that their focus is on advancing their own projects in order to achieve proficiency and independence. Additionally, it usually takes several years to acquire the scientific maturity and experience of a skilled staff scientist. These circumstances mean we must reevaluate the traditional structure of labs that are composed exclusively of a PI and his or her trainees. Some institutes are already applying new organizational methods by combining the expertise and interests of faculty members and experienced staff scientists (also known as research scientists).1 This model allows staff scientists to lead ambitious projects while also working collaboratively with PIs, advancing complex projects that could not be accomplished otherwise. Often, faculty and staff scientists with different kinds of expertise partner, providing a diversity of experience that is beneficial to both the individuals and to science.1 Combining the skills and interests of a PI with those of a highly qualified staff scientist can amplify a lab’s success rate and increase overall progress. This synergistic model allows for a higher level of creativity and achievement that may soon be necessary for even traditional academic labs to run efficiently and successfully. Currently, there are not many institutes that offer staff scientist positions, and they’re even rarer in university settings. Creating more staff scientist positions will be an ongoing challenge because long-held traditions create cultural barriers to change, and limited funding reinforces the use of more affordable postdocs. To retain more well-trained scientists in research-intensive roles, junior scientists and PIs must advocate for the creation of these positions within their research institutions and universities. Imagine a new era when universities and institutes recognize the benefit of providing positions with greater job security and professional respect, moving away from the practice of exclusively hiring inexpensive and inexperienced trainees. It is also important for up-and-coming scientists to realize that it’s possible to be ambitious and desire to do good science without running your own lab. Too often these things are seen as incontestably linked, which is not necessarily the case. Accomplished scientists who have decided not to pursue positions as PIs still make significant contributions to science. Therefore, being a staff scientist should be recognized as a valid, satisfying, and rewarding career path in its own right. Faculty members and institutions, for their part, should realize that the position of staff scientist does not imply a lack of scientific drive or disinterest in professional advancement and should strive to promote and nurture more of these positions.This model will help keep talented scientists in research-intensive roles and serve to advance the goals of both individuals and institutions. There exists a false narrative that the path to scientific success is always linear: from grad student to postdoc and then to PI. There should be alternative routes that create niches for experimentalists and the increasing numbers of devoted scientists who either do not want to open their own labs or are not able to obtain one of the rare tenure-track faculty positions.2 This would not only benefit these individuals, it would also move science forward at a faster and more efficient pace. 1.Hyman, S. “Biology Needs More Staff Scientists.” Nature 16: 283-284 (2017). 2.Kuo, M. “Staff Scientists Find Satisfaction in Playing the Support Role.” Science (2017). 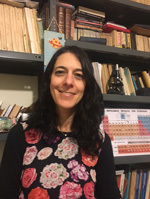 Irini Topalidou is a molecular biologist and geneticist who works as a Research Scientist in the Department of Biochemistry at the University of Washington in Seattle. She is a strong advocate for basic research and the use of model organisms in biological research. In her research she uses C. elegans and mammalian cells to study dense core vesicle trafficking and Gq signaling in neurons.